Adherence Digital is a creative digital marketing agency based in the historic town of Folkestone who specialise in Pay-Per-Click and Search Engine Optimisation. We act as an extension of your current marketing department, working incredibly closely with teams of all shapes and sizes to take your business further. Expert management, advice and consultation on all PPC matters. Use PPC to help generate more traffic and conversions. White hat search engine optimisation techniques. Multi-lingual campaigns which open your business to new markets. Mobile marketing is becoming increasingly important. We can help you develop your mobile advertising strategy. Analytics helps to understand the story your data is telling you. We work with you to translate date into actionable insights. Comprehensive solutions available. From training to reporting. We work with you every step of the way. From planning and implementation to ongoing development. We love to help businesses of all shapes and sizes conquer their digital marketing challenges. If you need help with a current marketing plan, or you need one put together and don’t know where to start, contact us for a no-pressure, no-obligation chat. Take Control of Your Marketing. Contact Us Today. 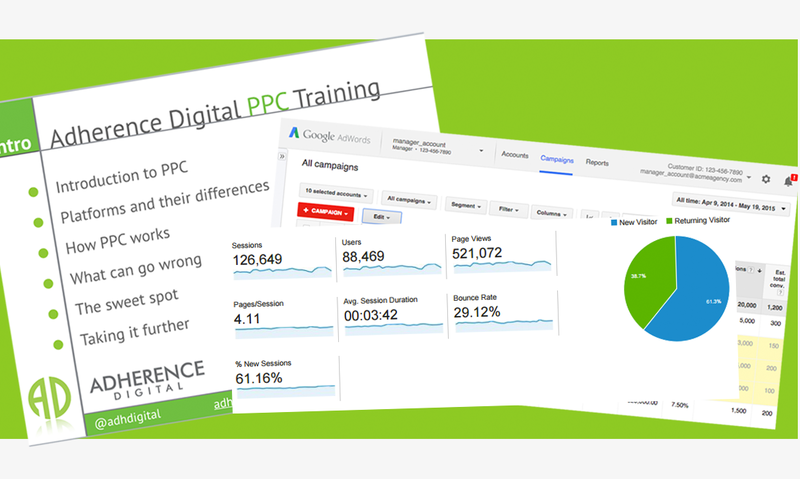 For Our Clients In PPC Revenue Alone. Digital Marketing experts in Kent. Contact us if you would like to talk about marketing or if you just want to say hi! Adherence Digital is a Bing Accredited Professional Company.